The Mississippi native has a long political career in the deep red state. Mississippi voters for the first time in the state's history elected a woman to the U.S. Congress. Republican Sen. Cindy Hyde-Smith defeated her Democratic opponent Mike Espy on Tuesday in a surprisingly competitive runoff election for one of the state's U.S. Senate seats. 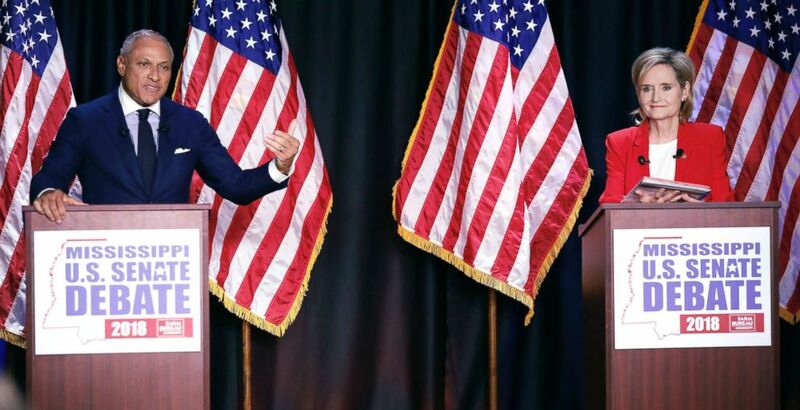 The race was the final contest of the midterm cycle and featured a last-minute visit by President Donald Trump, who Hyde-Smith thanked personally on Tuesday evening. "Mr. President, and I just talked to him so I know he’s watching, thank you so much for everything," Hyde-Smith told a crowd of supporters. Support for the president and his agenda was a hallmark of Hyde-Smith's campaign. The side of Hyde-Smith’s campaign tour bus features a huge picture of her with Trump. She has a 100 percent "Trump score," which is a measure of how often a member votes in line with Trump’s position, according to FiveThirtyEight. And in the Senate she is only joined on the list by Arizona Sen. Jon Kyl, who was appointed to fill the late-Sen. John McCain's seat, and former Alabama Sen. Jeff Sessions, who was fired earlier this month as Trump's attorney general. And on the campaign trail, Hyde-Smith was stitching the president’s remarks into her own, showing her fealty to Trump with voters. 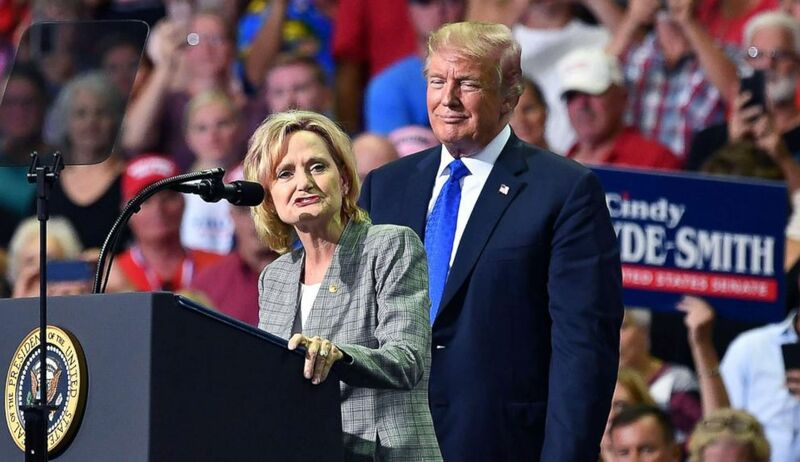 (Mangel Ngan/AFP/Getty Images) Senator Cindy Hyde-Smith takes the stage with President Donald Trump at a "Make America Great Again" rally at Landers Center in Southaven, Miss., on Oct. 2018. "We’ve got a president that is a leader," she told a small crowd in Nesbit earlier this month. Her campaign strategy to win over Trump’s voting bloc has been successful and voters have said that they see Hyde-Smith as the only candidate who will advance the president’s agenda. Trump’s endorsement earlier this year bolstered her candidacy in a state that voted for him by nearly 20 points in 2016. On Election Day, in the "jungle primary" format, which allowed for multiple contenders in both parties, she garnered 40.6 percent of the vote, just shy of the 50 percent she needed to win the special election outright. Tuesday's runoff was supposed to be a procedural hurdle for Hyde-Smith, but a series of controversies helped her opponent, Democrat Mike Espy, gain ground in the deep red state. (Rogelio V. Solis/Pool via AP) Democrat Mike Espy, left, challenges an answer from appointed U.S. Sen. Cindy Hyde-Smith, during their televised debate in Jackson, Miss., Nov. 20, 2018. Hyde-Smith started her political career in 1999 when she was elected, as a Democrat, to serve as a state senator. She switched to the Republican Party in 2010 and went on to serve as the state's agriculture commissioner. She served as commissioner from 2011 until her appointment to the U.S. Senate in March to fill the seat vacated by Sen. Thad Cochran. But days after the midterms, her campaign appeared to be stumbling after a series of public statements on video and a collection of public photos from 2014 were released, calling into question her views on race and voting rights. She drew fierce blowback when a video surfaced showing Hyde-Smith, who is white, embracing a supporter after he praised her and saying before a cheering crowd, "If he invited me to a public hanging, I'd be on the front row." In the wake of the video's release, Hyde-Smith didn't apologize but rather defended herself in a statement. "In a comment on Nov. 2, I referred to accepting an invitation to a speaking engagement," she said. "In referencing the one who invited me, I used an exaggerated expression of regard, and any attempt to turn this into a negative connotation is ridiculous." Four days later, another video of Hyde-Smith, from Nov. 3, was posted on Twitter. This time, she was seen telling a group of supporters in Starkville, Mississippi, that she thinks it’s a "great idea" to make it harder for "liberal folks" to vote. "Then they remind me, that there's a lot of liberal folks in those other schools who that maybe we don't want to vote. Maybe we want to make it just a little more difficult. And I think that's a great idea,” she appears to be saying in the video posted by the same publisher who posted the first video. Hyde-Smith once again refused to apologize for her comments. Instead, her campaign spokesperson released a statement Thursday that said, "Obviously Sen. Hyde-Smith was making a joke and clearly the video was selectively edited." In the first and only debate in the race, Hyde-Smith sought to address the concerns about her views — reading an apology from her notes to "anyone offended by my comments" — a vague reference to the uproar over the racially tinged joke about "public hangings" that pushed the race into the national spotlight. "For anyone that was offended by my comments, I certainly apologize. There was no ill will, no intent, whatsoever in my statements,” Hyde-Smith said in her statement. The president has defended Hyde-Smith. "She made a statement which I know that she feels very badly about it, and it was just sort of said in jest. She's a tremendous woman, and and it's a shame that she has to go through this," the president told reporters. Kendall Karson and John Verhovek contributed to this story.